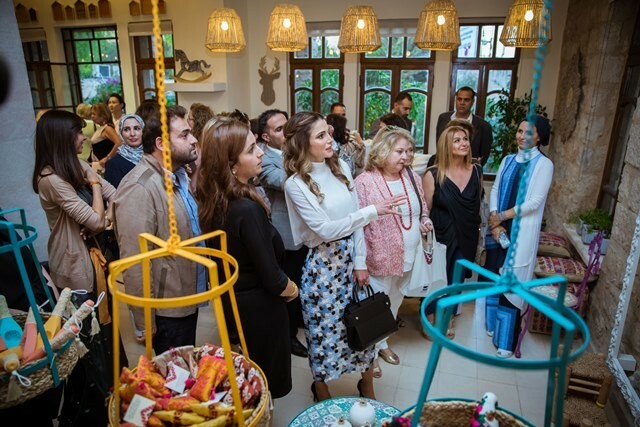 (Office of Her Majesty – Press Department – Amman) - Her Majesty Queen Rania Al Abdullah inaugurated the Jordan River Foundation’s (JRF) 21st annual handicrafts exhibition titled “Dahnoon,” at the foundation’s main showroom in Jabal Amman on Monday. JRF Director General Mrs. Enaam Barrishi accompanied Her Majesty while touring the exhibition and viewing the handmade items on display. The exhibition displays modern designs and intricate handicrafts produced at JRF’s various workshops and centers, and hand-made by women from the villages of Bani Hamidah and Wadi Al Rayyan, as well as the Jabal Al Natheef neighborhood of Amman. The exhibition is an opportunity to highlight and showcase the products made by beneficiaries in JRF’s areas of operation. This year’s exhibition celebrates the red wildflower that blooms across Jordan in the early weeks of spring. It is referred to as ‘Poppy’ in English and is known as ‘Shaqa’eq Al Numan’ or ‘Dahnoun’ in Arabic. The exhibition displayed three collections of handicrafts. The ‘City Heritage Collection’ combines the art of hand-stitched embroidery with photography using mixed media techniques. The ‘Calligraphy Collection’ incorporates positive messages and traditional children songs’ embroidered and printed in Arabic on a variety of products including home furnishings, cushions, glasses, notebooks, candles, and wall hangings. And the ‘Jury and Kirdan Collection,’ which means ‘rose buds and necklaces,’ is a unique take on elegant pieces that combine Jordan’s nature, represented by the rose buds, and traditional necklaces worn by older Jordanian women. The pieces are created using the Filling and Palestinian embroidery techniques. The opening of JRF’s 21st Annual Handicrafts Exhibition was attended by foreign ambassadors, JRF board members and beneficiaries, donors, guests of the local designers, and heads of Her Majesty’s Affiliations. The 21st exhibition also marked the introduction JRF’s new e-commerce website, which Her Majesty officially launched during the event. The website will allow international shoppers to buy JRF handicrafts online at www.jordanriverdesigns.com and have them shipped anywhere in the world. The Jordan River Foundation’s 21st annual handicrafts exhibition is currently on display at the foundation’s showroom situated in Jabal Amman’s Rainbow Street. For more information about JRF, please click here.